Stuff Points: Earn 125 points when you buy this stuff. A great option for compact living quarters, or people that rarely wash large loads. This powerful washing machine features a completely automatic cycle, and it runs on electricity by plugging into any standard outlet. Instead of dumping water in, or tipping it over to pour out the dirty stuff, high quality intake hoses attach to a sink faucet to make the process effortless. Included adapters ensure a proper fit, and a superior design makes them easy to take on and off. Simply load with clothing, add some detergent, set the computer controls to the desired setting and you are good to go. 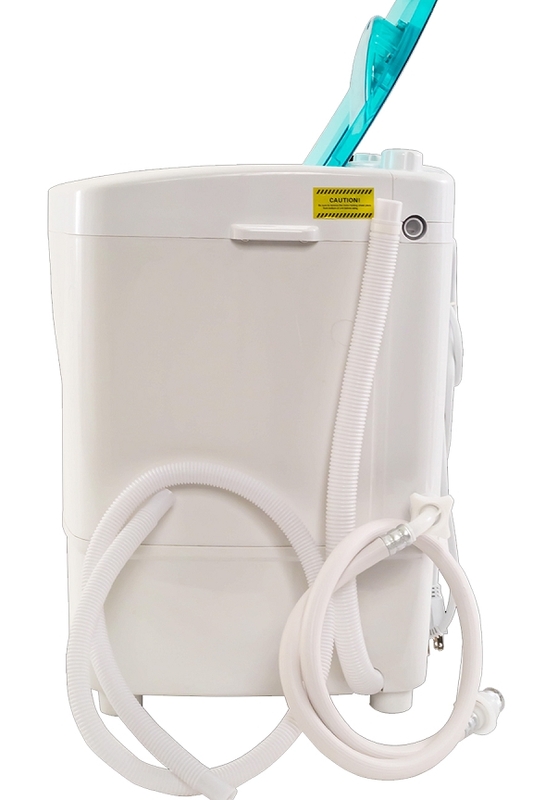 It even has an automatic rinse cycle to remove soap, and leave your clothing super clean, and free of residues and irritants. It's great for anyone that lives where larger machines aren't possible, but also nice for other folks that would prefer to wash certain things separately. Use occasionally for cloth baby diapers, delicate undergarments, silks and other fine fabrics, or use all the time to avoid trips to the laundromat. It's also the perfect portable solution for RV travel or camping, and will allow you to have clean clothes while traveling without breaking the bank, or wasting time searching for a coin operated machine. This machine comes in two different versions. The Plus model is the one featured here, but we also carry the Basic model for those that want to spend less. What's the difference? This one has a computer control panel that allows you to set your own cycle, and it will automatically run a rinse cycle without you doing anything. Just press start and it will run through a full wash and rinse to clean your clothes. 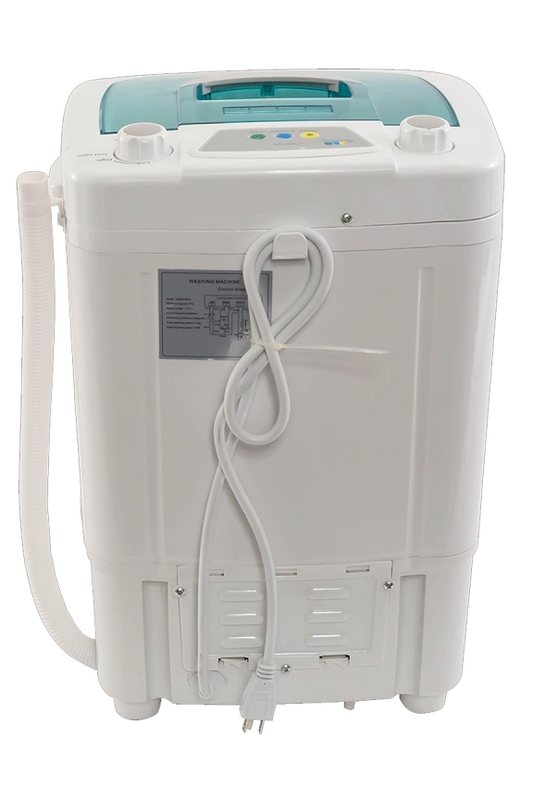 With the basic model, there is no button to push, and no automatic rinse cycle. It has a timer knob to allow you to determine how long it will run, and you will wash and rinse separately. They both clean in the same way, and they both have the same capacity. They only difference will be the computer control panel. Large Capacity. Ample, 4.4 lb capacity is big enough for several items at once, and will even accommodate larger garments like jeans or bed sheets. Automatic. Computer controls allow for easy operation. Set and forget the optional rinse cycle. Effortless Filling. Features intake hoses that hook to your faucet. No need to pour in water manually like other options require, but you can fill without hoses if you need to. Compact and lightweight. Only weighs 14 lbs. and the small size makes it easy to place on a counter, or take with you while traveling. Compatible. Use it almost anywhere. It hooks up to any regular, 110V outlet. Compact. It fits on a counter top for easy draining, but it also has a pump that you can use if necessary. To prepare for washing, connect the inlet hose to your faucet. Turn on the faucet, and set to desired temp. Plug in the power cord. Any standard outlet will do. Load clothes into the drum, and make sure to spread evenly and not overload. Add detergent. 1 tablespoon or less is normally sufficient, but you can vary amount depending upon clothes and amount of soil. Press the on/off button to turn the power on. The power and auto indicator light will illuminate. Press the start/pause button to begin washing. The default setting is the "auto" setting, and that will automatically start. If you press the program button, you can cycle through the other settings to choose something different. Then press start to begin. When finished, the machine will buzz to let you know. Unplug the washing machine and turn off the water. Uses Wash small loads with little to no effort. Perfect for apartments, dorms, RV's, camping and more. Wash clothes with less electricity. Computer Controls Yes - Automatic washing and rinsing. A powerful tool in a compact package. Get your clothes incredibly clean without using a large machine, or running to the laundromat. Order Yours Today. This washer is cool. The clothes come out very clean. ...also has a pump for draining water... I love my little machine. This little machine is awesome it works by the pressure of water and clothes you put in so if doesn't work or stops it may need more water boy she is awesome love her named her Molly. The MiniWash Plus works great! I love it! The only problem is the connector to the faucet is always leaking water. I have been very pleased with the washer that I bought. I was quite surprised at how large it is. I received it very fast and in great condition. I have no complaints at all. Thank you. I Love my mini washer, it's very convenient for me. I would highly recommend everyone who needs a mini washer to buy one. I purchased the Miniwash plus a month ago and it has been a blessing to me. Shipping was very fast to my surprise. My baby changes clothes a lot daily so her little hamper is always full. The mini wash Plus is excellent for small washing load, it's very powerful, and small enough to sit properly on most on kitchen counter when in use. I would recommend it!!!! I am a single woman living in an apartment that has no laundry facilities so every weekend I had to spend several hours of my time schlepping at least 3 loads of laundry to the laundrymat. One weekend I even had a load of clothes stolen from a dryer. Needless to say I hate the laundrymat! This little portable washer allows me to wash several small loads of clothing the week so that I only need to go to the laundrymat once a month with sheets and towels. It is easy to set up as well as store away. It uses very little laundry detergent and cleans exceptionally well. It doesn't have a spinner so you do have to squeeze the water out and that makes drying time longer. 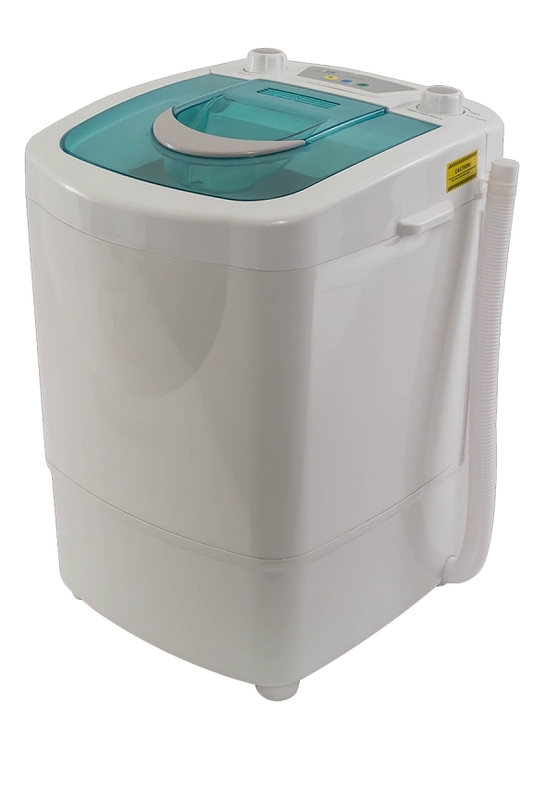 I rate the The Laundry Alternative Miniwash+ Portable Automatic Electric Mini Washing Machine a 5 out of 5 In my search for a small wash that works I have be using the Miniwash Plus for about one month now. Love it. Love it. I can't have a regular washer in my apartment. I use it to wash my underwear mostly. I don't like washing them in the laundry room washers. I also bought a Haier HLP21N Pulsator Top Loading Portable Washing Machine and I send it back. It use to much water I washed the same amount of clothes as the miniwash plus and it used less water and cleaned just as well as the Haier portable washer and it made so much noise I was afraid to use it. The miniwash plus is so quiet. I also had a wonder washer it worked great, but after two year it broke I wanted a electric one, cause it was a lot of work turning it, but I do have great arms (smile). Over all the miniwash plus clean my clothes very well. Great little machine. I bought a Mini Counter top Spin Dryer to wring out the clothes. They dry fast in three hours or so. Take it from me ,I am picky for when it comes to items I buy. This washer is cool. The clothes come out very clean.I put washed many t-shirts at once.You can use it to wash bedsheets one at a time and yes it washes jeans 1 at a time cause other wise 2 will tangle.Very powerful washer also has a pump for draining water but automatic water fills.There is no temperature automatic switch ok as you will hve to control tht by the faucet but big deal...right? It has a rotating spin thing down below ok another words it doesn't use jets to wash your clothes,I forgot the name but it spins back and forth to get clothes clean. I love my little machine.Now here is something they don't say as it took me a bit to figure out but on the left side at top you hve to pop off the control button cause that is where you hook up the water flow hose ok? cool now you know.It looks very nice and lite weight. BUY IT!! The machine is way to small And doesn't have a spin dry cycle! does this also spin the clothes? I'm looking for one that washes and spins in the same drum. It agitates while washing, and it is able to rinse after cleaning, but it does not have a spin cycle for drying. Most people go with a separate spin dryer for this purpose. 49 of 52 Customer(s) found this Answer helpful. 1) How long is the wash cycle, and 2) can the wash speed be adjusted, like for delicate or harder wash? The wash cycle can take anywhere from 15-37 minutes. You can just rinse, or just wash, and then you can wash and rinse with the option of one or two rinse cycles. You can not adjust the speed, but you will have two settings for water level; high and low. 26 of 26 Customer(s) found this Answer helpful. Hi, The machine doesn't fit on the counter top. If it is put beside and lower than the sink, will it be able to drain? In the description it says "It fits on a counter top for easy draining, but it also has a pump that you can use if necessary". Could you please explain how? What do we need to do to use the pump? Thank you. You don't need to do anything. It pumps automatically to drain the tub. It can be above, level, or below the drain, and it will still work fine. 18 of 19 Customer(s) found this Answer helpful. You will find both materials on the interior. 15 of 20 Customer(s) found this Answer helpful. How many items can be washed at one time? It will depend on the type of item, but with most things, you can do several at once. The official capacity is 4.4 pounds of dry laundry. My faucet shows as the 'incorrect' type. Is it possible to fill manually? Inlet takes very long as water can not flow. Also - when product shows washing, there is no movement as to show that it is washing as other people have stated. Does there need to be a certain amount of water before wash ? You could fill it manually, but you would also have to add more water for the rinse cycles as the washing process continues. When enough water is inside, and it is washing, you should see everything spin in one direction, and then spin back in the other direction, over and over again. 12 of 12 Customer(s) found this Answer helpful. Out of the choices available right now, this washer has the largest capacity, and none of them have a spin cycle. 1.What is maximum water temperature for MiniWash? 2.You gave only 1 picture of the MiniWash. Where can I look another pictures? 3.What plastic type has MiniWash? 4.What part of interior has stainless steel? 1. Max water temp is 122 degrees F 2. We will be adding more pictures soon. 3. Information on exact plastic type is not available. 4. The interior is mostly plastic, not stainless steel. where were the "MiniWash Portable Washing Machine" and the "Wonder Spinner" manufactured? Thank you. Can it wash bath towels and bath robes? Is this washing machine shipped in a plain box that does not identify what is inside the box? Yes. It is a plain brown shipping box. The instructions say to turn on the faucet at the beginning of the cycle, and only instructs to turn off the faucet at the very end. Won't that make the machine overflow? No. When connected correctly, it will only draw water from the faucet when needed, and there is no risk of overflowing. Essentially, when it needs water, a valve will open to let it in, and when it's full, the valve will close to stop the flow of water. It's all automatic. 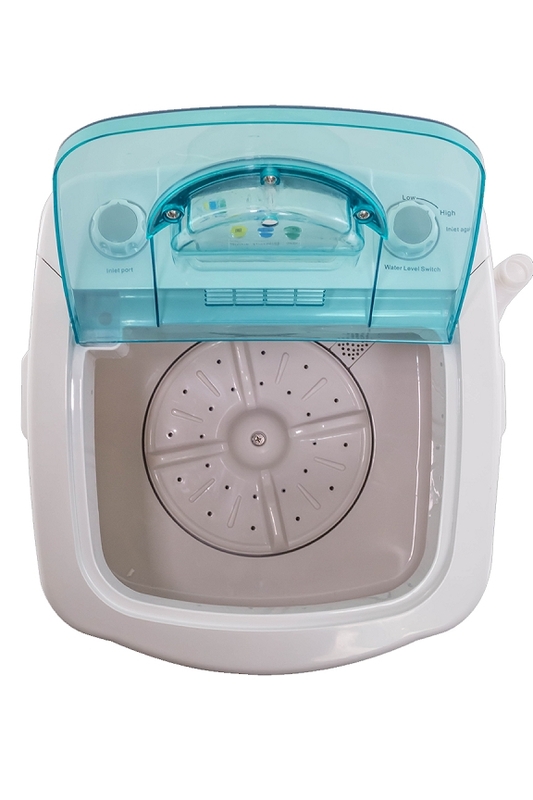 I am looking for a mini washer like this, but from what I am reading they do not do the final spin. Are there any of these small washers the sort that spin so that all I have to do is put them into a dryer? We currently have two models that wash, rinse and spin. This is not one of them. This model only washes and rinses. If you would like some help choosing the best machine for your needs, please give us a call. Whether it is possible to fill in water manually? To ensure proper operation, it is recommended to attach to a faucet. The necessary adapter is included with purchase. Can this be connected to a bathroom faucet? It would not be guaranteed, but yes, it will hook up to some bathroom faucets. Does anyone the size of the quick-connect faucet adapter that ships with this unit? The quick connect fits standard kitchen faucets. It features an adaptive design so it will expand or contract slightly to fit in place. I'm only interested in washing hand washables. Is this washer considered gentle enough for hand washables? Absolutely! Many people get them just for this purpose. warranty sounds great, but I need to know more. Is it possible to see the terms of the warranty? We do not have info on the exact terms, but this manufacturer does stand behind their products. You would need to inquire about specifics with them. 4 of 9 Customer(s) found this Answer helpful. Can I just do one rinse cycle? What size adapter do i need to purchase to connect my washing machine to my sink? In most cases you can just unscrew the aerator on your faucet and it will attach without trouble. For a more convenient situation, you can get a replacement aerator intended for portable dishwashers. With this in place, you won't have to unscrew anything to do your laundry. I need this washer because of the 12' by 12' size to just to wash small items. How dry or wet do the clothes come out with no spin cycle? Do i need to ring them out? They will be pretty wet, so you'll have to use a spin dryer as well, or plan on wringing before you hang to dry. No it doesn't spin the clothes it just does an automatic rinse cycle, the full automatic washer however does have a spin cycle.